THE economic cost of sea and river flooding will treble unless climate change is tackled, a European Commission report has warned. The impacts of river flooding will be most pronounced in Ireland and the UK if a business-as-usual model is adopted and global warming isn't tackled. The Joint Research Centre's (JRC) 'Climate Impacts in Europe' report says there will be positive impacts, including a rise in tourism as people flee baking summer heat, and a rise in agricultural production – but economic damage from winter storms will cause crippling bills. Flooding has resulted in insurers paying out almost €750m in claims since 2000. The Office of Public Works said an extensive flood relief scheme would be ready for construction by the end of next year, but the JRC report suggests that further devastation will occur in other towns and cities if temperatures rise by 3.5C by the end of the century. Even if policies aimed at mitigating against the worst affects are adapted, which could result in the EU's target of limiting temperature rise to 2C, major economic costs would arise. The report covers the impact of climate change on a range of sectors including agriculture, energy, river floods and transport in the period 2071 to 2100. 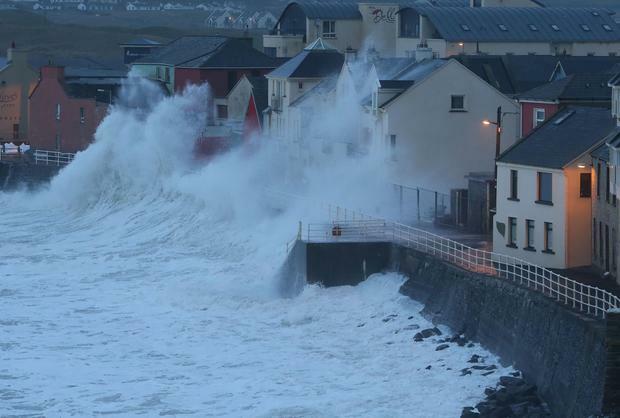 It says the cost of sea flooding will rise from €996m to almost €3bn in Ireland and the UK. Even if warming is kept to 2C, costs will still increase to €2.4bn. Direct economic damage caused by flooding is currently estimated at €5bn per year across the EU, which will more than double to €11.4bn. "This increase in damages would occur mainly in the UK and Ireland, where damages are tripled up to €3.3bn a year (up from €872m) and the Central Europe South region, where damages raise from €2bn up to €5.2bn," the report stated. The largest increase in the number of people affected is projected for the UK and Ireland. The economic cost would be highest in the UK, Ireland, Italy, Holland and Belgium. Professor John Sweeney, who compiled UN reports on climate change, said the reason why coastal and river flooding would be more pronounced here was due to high rainfall and proximity to the Atlantic. "Ireland's wetter, and has a winter maximum rainfall, with more impermeable soils which tend to be waterlogged in winter," he said. "Because we're at the western side of Europe we also bear the brunt of storms from the Atlantic unlike the other countries which are less affected." The report also says that agriculture yields will drop by 11pc across Europe, and by 2pc in Ireland, if no action is taken. If global warming is kept to 2C, agricultural output would double in Ireland and the UK, as losses in southern Europe would result in more production across the northern half. On energy, it says that overall demand would drop by 13pc, or 14pc in Ireland.